A zoetrope is a device that produces the illusion of motion from a rapid succession of static pictures. The zoetrope consists of a cylinder with slits cut vertically in the sides. On the inner surface of the cylinder is a band with images from a set of sequenced pictures. As the cylinder spins, the user looks through the slits at the pictures move round. The scanning of the slits keeps the pictures from simply blurring together, and the user sees a rapid succession of images, producing the illusion of motion. Animals such as: horses running, 2 seals throwing a ball to each other with their noses, tiger running. 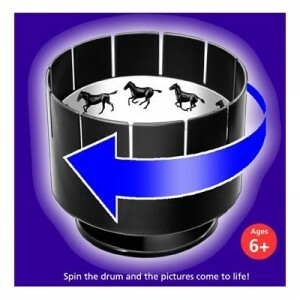 For full list of animations available please see the individual zoetrope animaltion products that we have available and the list will be included with each product.